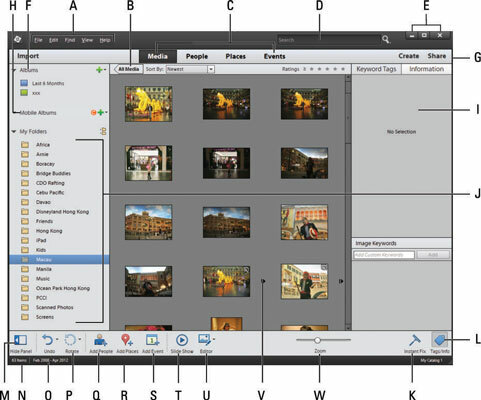 The Photoshop Elements Organizer enables you to tag photos, organize and annotate files, create versions and stacks, create photo albums, and perform other tasks so that you can quickly sort through large collections of photos. Here is an overall view of the Organizer workspace and the various panels associated with it. A.Menu bar: The Organizer menus appear in the top-left section of the menu bar. In Windows, the menus belong to the application. On the Mac, the menu bar is part of the operating system’s menus. B.All Media/Sort By: When you click a folder as you see in item J, the thumbnail images shown in the Media Browser (item V) display only those photos within the selected folder. The figure shows the Macau folder selected. If you click the All Media button, you leave the selected folder and see all photos from all folders in the Media Browser. Adjacent to the All Media button is a drop-down menu where you can sort the thumbnails in the Media Browser according to Newest, Oldest, and Batches of photos that you imported. Media: The first tab is Media. Click the Media tab to display thumbnails of photos either in a folder or in the entire catalog. People: Click this tab to display photos where you have tagged faces. Places: Click this tab, and a Google map appears in the Panel Bin. Geospatial mapping was available in Elements 11, where you can tag photos according to map coordinates by using Google maps. You click the Add Places button (item R) to tag an image with a place on the map. Events: Click this tab to display photos that have been tagged as Events. To tag a photo with an event, click the Add Event button (item S). D.Search: Any photos you have tagged with keywords can be searched. Type the search criteria such as the name of a person you have tagged with the People tag in the text box, and then press Enter/Return or click the magnifying-glass icon. E.Features buttons: In Windows, you find Maximize, Minimize, and Close buttons in the top-right corner of the Organizer. On the Mac, in the top-left corner you find Close, Minimize to Dock, and Maximize. F.Albums: When you create albums, your albums appear at the top of the left panel. G.Create/Share: These two items are drop-down menus. You choose a menu item that takes you either to the Photo Editor or a wizard where you work step-by-step to complete a task. H.Mobile Albums: Click the Refresh arrow and you can sync photos stored in your Adobe Revel albums. I.Panel Bin: Within the Panel Bin, you find various panels that are docked. By default, you see Keyword Tags, Information, and Image Keywords. J.My Folders: You import photos in the Organizer, and the photos are organized by folders. K.Instant Fix: Click this button, and you see the same panel in the Organizer that opens when you select Quick mode in the Photo Editor. The nice thing about having the Quick mode options in the Organizer is that you don’t need to open files in the Photo Editor to apply some edits to your photos. L.Keyword/Info: If you click this button while the Keyword Tags panel is open, the Panel Bin is dismissed. Click again to display the Panel Bin. M.Hide Panel: Click this button to hide the left panel. If you click this button and the Keyword/Info button (item L), you can hide both panels. Doing so provides you a maximum viewing area for the photo thumbnails. N.Status bar: The bottom of the Organizer window provides information. On the left, you see the number of items in your catalog and the date you created the catalog. On the far right, you see the name of your catalog. O.Undo/Redo: Click the tiny arrow and a pop-up menu displays Undo and Redo. Choose an item to undo or redo your last action. P.Rotate: When you click the arrow, you can choose to rotate a photo clockwise or counterclockwise. To use either tool, you must first select a thumbnail in the Media Browser. Q.Add People: Elements does a nice job of recognizing people, but it has a hard time with profile shots, tilted heads, and photos where people are not easily recognized. Double-click a photo to zoom into it and click the Add People button. A new rectangle appears in the photo that you can move to position and add a name. R.Add Places: When you click Add Places, a window opens atop the Organizer. A filmstrip appears at the top of the window, displaying files currently shown in the Media Browser. Below the filmstrip is a large map where you can assign map locations to the photos you select in the filmstrip. S.Add Event: Add Event is yet another item that helps you organize your photos. You can add tags for people, places, and then events to help narrow down a large collection of photos. Each of these items can be sorted by clicking the respective tab at the top of the Organizer. T.Slide Show: Slide Show provides an onscreen view of all the photos you have open in the Media Browser. You can sort photos according to tags, click Slide Show, and sit back and watch the photos scroll on your computer monitor. U.Editor: Click to return to the Photo Editor. V.Media Browser: Shows thumbnail displays of your images. W.Zoom: Adjust the slider to see thumbnails larger or smaller.